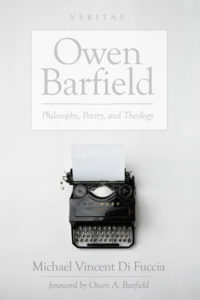 Available in the Veritas series: Owen Barfield: Philosophy, Poetry, and Theology, by Michael Vincent Di Fuccia. This book contains a foreword by Owen A. Barfield, the grandson of the Inkling Owen Barfield. In this book Michael Di Fuccia examines the theological import of Owen Barfield’s poetic philosophy. He argues that philosophies of immanence fail to account for creativity, as is evident in the false shuttling between modernity’s active construal and postmodernity’s passive construal of subjectivity. In both extremes subjectivity actually dissolves, divesting one of any creative integrity. Di Fuccia shows how in Barfield’s scheme the creative subject appears instead to inhabit a middle or medial realm, which upholds one’s creative integrity. It is in this way that Barfield’s poetic philosophy gestures toward a theological vision of poiesis proper, wherein creativity is envisaged as neither purely passive nor purely active, but middle. Creativity, thus, is not immanent but mediated, a participation in God’s primordial poiesis.